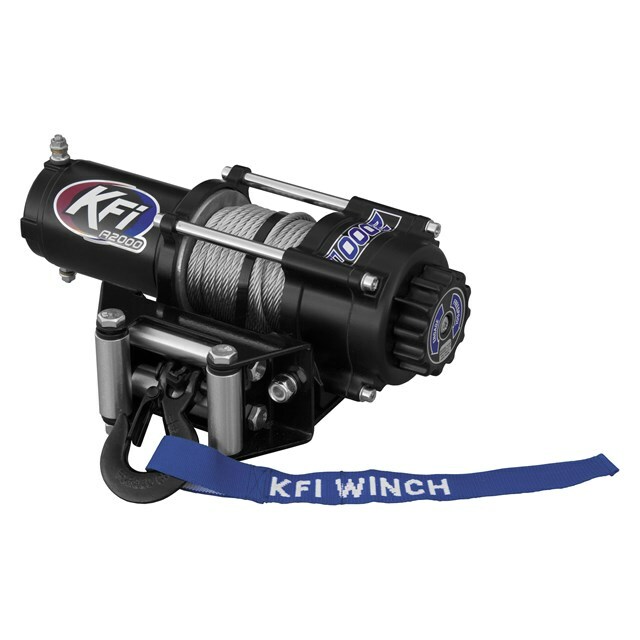 Each KFI winch kit features quality cast aluminum and durable steel components and comes with a full complement of accessories, including Premium Roller Fairlead, a fairlead bracket for mounting to trailers or other non-ATV applications; Handlebar Mini-Rocker Switch; 14 ft. corded handheld remote on 3000 or larger; all of the hardware to mount your winch to a model specific ATV/UTV winch mount; a heavy-duty Electric Contactor that protects the electrical system and detailed installation instructions. An ATV/UTV model specific winch mount must be purchased separately. They are also backed by a KFI one-year limited manufacturer’s warranty. Features a water-resistant seal to keep out the elements, four-bolt mounting pattern and all-stage planetary gear system with all metal enclosures.